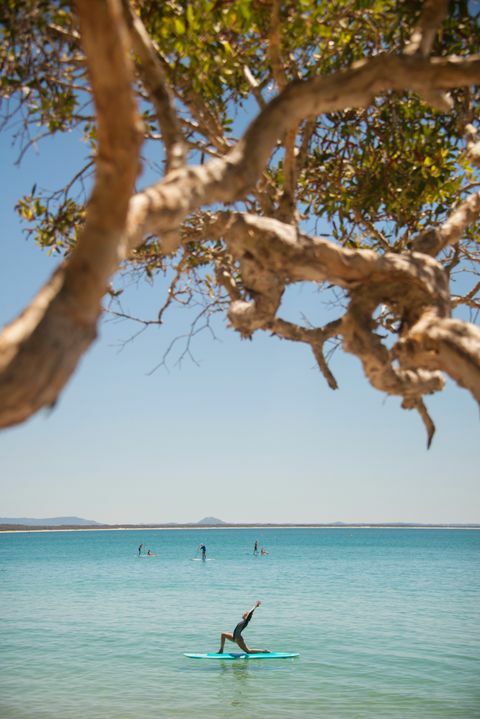 Sunshine Coast | Air Supply: Where to Breathe the Best O2 on Earth! Air Supply: Where to Breathe the Best O2 on Earth! “Like breathing in Nirvana? Yeah, that's it,” says Kat Harding, grinning widely; her brain finally solving a pretzel-like search for the right words. Stepping up as the first stand up paddle (SUP) yoga teacher formally trained in Australia (in 2013), the Sunshine Coast local – on the line-up of next month's Wanderlust Sunshine Coast (9-12 November 2017) – is sitting cross-legged, Lotus-style, when the Eureka moment strikes. 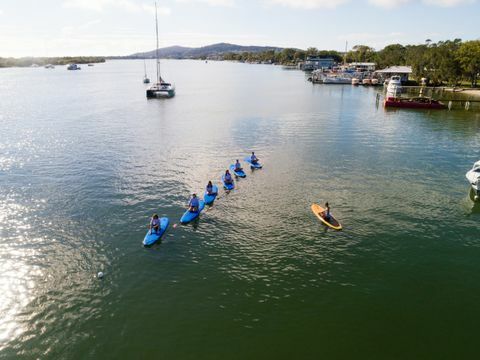 “The ocean and waterways are Mother Nature's lungs, producing more than half the oxygen we breathe,” Kat says during a SUP yoga class on the Noosa River. Watch it here! “Studies show every second breath we take comes from the ocean – so, practicing yoga [focusing on breath] atop this beautiful source of O2 goodness is simply mind-blowing. Therein lies the beauty of SUP yoga on the zen-factor Sunshine Coast. A real-world Nirvana and one of the freshest destinations on Earth; home to 100km of pristine coastline, beaches, lakes and waterways. Not forgetting one of only two Everglade destinations on the planet (and the only one you can swim in, minus gators and crocs found in South Florida's Everglades National Park) as part of the 150,000ha Noosa UNESCO Biosphere Reserve. For Kat, it's the best "office" possible; one arguably pre-destined for the 28-year-old who descends from a strong line of Venetian women (her great grandmother lived to 108 and had 18 children!) hailing from Italy's floating city where SUP paddling takes its early roots via use of gondolas. 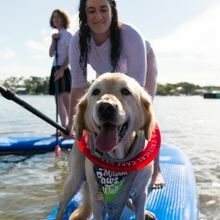 As Kat sees it, the life of a SUP yoga instructor also provides the ultimate job satisfaction, namely connecting people with nature. 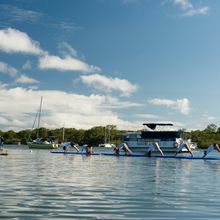 On any given day, her floating yoga studio (courtesy Mother Nature) comes with the possible win-win of sharing a class with sea turtles as they pause to take a breath of fresh air at the surface or pods of playful dolphins cavorting in waters around Noosa National Park (north of Little Cove). The other beauty of SUP yoga, Kat says, is simply that anyone can do it – the only pre-requisite being knowing how to swim. “SUP yoga not only breaks down the barriers for those who don't consider themselves yogis, it encourages them to get outdoors,” she says. Kat's mum, Flora, is living proof. In fact, at 54, it's hard to get her off a SUP board, especially when conditions are perfect. Pretty much all year round on the Sunshine Coast, which averages 300 days of sunshine each year. “Mum was actually into yoga before me and seeing the change in her was the reason I decided I wanted to become a yoga teacher. I got to return the favour by encouraging Mum to try SUP yoga, which initially terrified her. “She was never a water baby and was a bit scared of the water, even when we were kids. It was always Dad in the water and Mum sitting on the beach. So, for me to get her on a paddle board was a turning point, and yoga was the key. “Now Mum and Dad have their own SUP boards and go out paddling together all the time." Kat's further extending the favour, with plans afoot to launch a SUP yoga course for women and men aged 50+ (at her Mum's behest). Best of all, she says connecting people of all ages with nature empowers them to protect it. Om to that! It's the reason Kat's returning to the all-star line-up at Wanderlust Sunshine Coast, billed as a four-day celebration of mindful living. And, notably, the only Aussie instalment of a global festival that ventures beyond the yoga mat to workshops with thought leaders on everything from the environment and sustainable living to holistic health, personal empowerment and progressive politics. Staking its place as one of more than 100 of Australia's best live events in the best destinations on the It's Live! 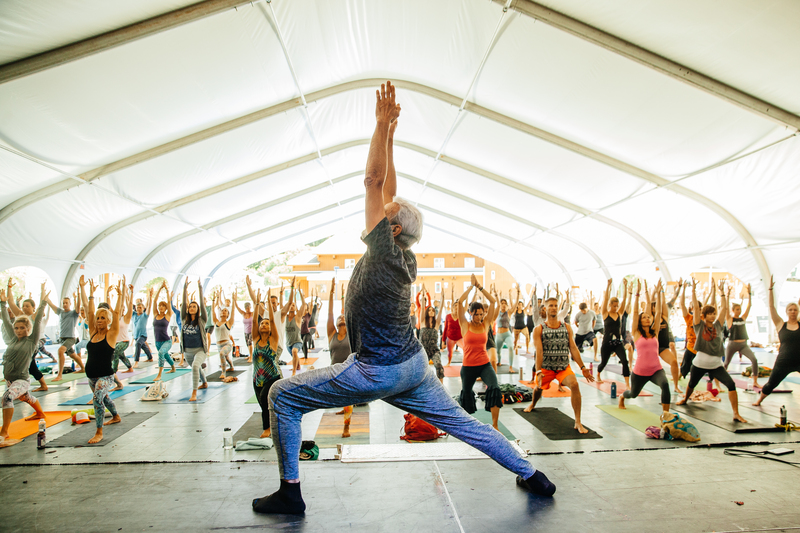 in Queensland calendar, the festival doesn't just bring together 'rock star' yoga instructors from across the globe. 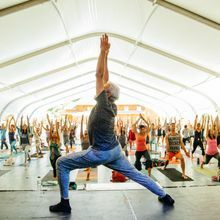 It also harnesses music as its heartbeat, complete with DJ-powered yoga classes, acoustic musical meditations and electric mainstage performances. This year's talent includes US hip-hop band Arrested Development (Wanderlust Sunshine Coast is the only Queensland stop on their 25th anniversary tour) and Emmy award-winning American singer-songwriter Toni Childs, set to wow crowds, combining three decades of yoga with song and dance in a 90-minute healing journey of the soul. A stroll away from Wanderlust Sunshine Coast base camp at Novotel Twin Waters Resort, the festival also takes to the beach, serving up surfing classes for beginner to experienced wave riders. 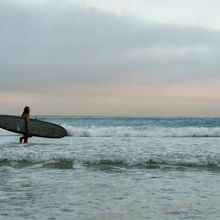 Here, Kat says SUP yoga is the perfect confidence builder and intro for anyone wanting to 'lose the paddle' and learn to surf. As she explains, both activities require focus, flexibility and balance – but only yoga, teaches requisite skills at each student's individual pace. 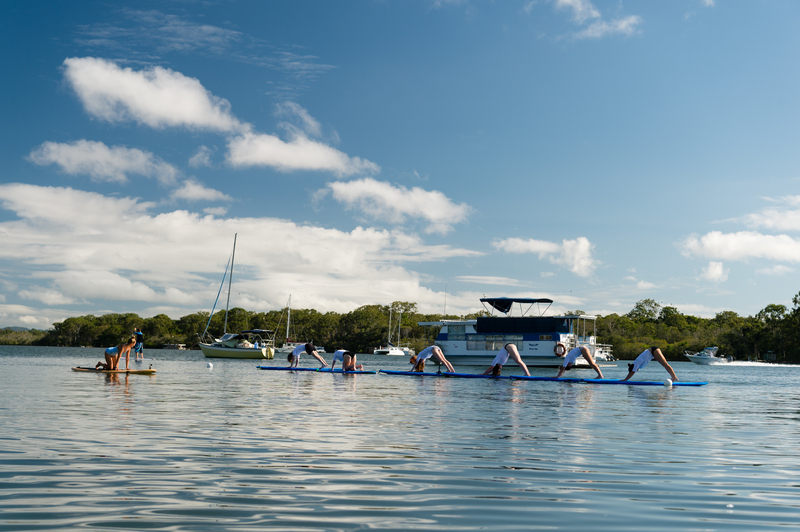 Other SUP yoga benefits: learning it's ok to fall and get back up and not take life too seriously. Did you know? 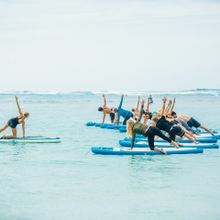 SUP yoga has deep connections to surfing and tourism, hailing from the 1940s when Waikiki beach boys were among the first to stand on a board with a hand-held paddle to teach and take photos of tourists learning to surf! 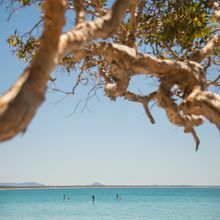 Hop onboard with SUP yoga guru Kat Harding at Wanderlust Sunshine Coast (9-12 November 2017) – the only Aussie instalment of the world's most epic yoga festival. 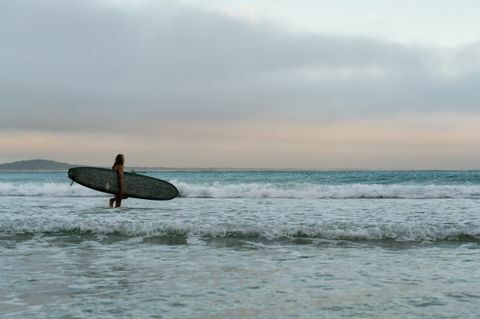 Watch her here and find out why SUP yoga is the hottest new thing this Summer. Gone to the dogs: there's more than one way to perfect your downward dog! 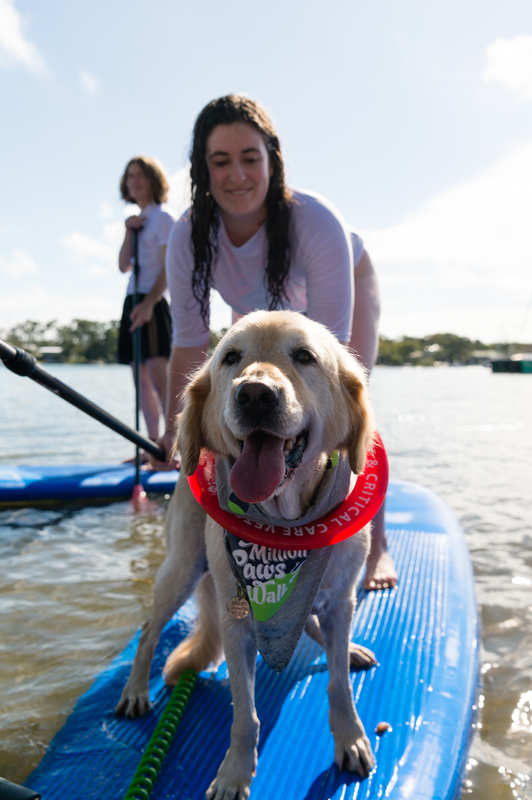 The annual Noosa Festival of Surfing, in March, includes howl-factor dog SUP racing and surfing! Check it out here. 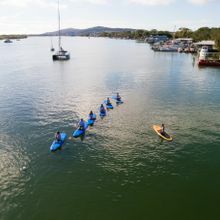 Discover the Noosa Everglades (nicknamed the River of Mirrors): a 60km stretch of pristine waters – home to 44% of all Australian birdlife and 700 native animal species – nestled between Noosa North Shore and Rainbow Beach. Find out why it's best experienced by kayak. Super-sized action: Sunreef Mooloolaba offers Swim with Humpback Whale encounters from July to October. Check out all the places you can swim with these gentle giants in Queensland. Don't just inhale fresh air, but fresh food goodness! The Sunshine Coast is a foodie's haven, ripe for the picking. Choose your adventure here.